2x LED 225 Lights + 130w CFL 2700k & 6400k. Growing with LOW heat, LOW energy bill. Use 6400K for growing stage, use 2700k for flowering stage. Use LED for the full cycle to gain full spectrum for your plants. 2x LED225 - red & blue light panels. 1 pair x Yoyo (2pcs). 1x LH10-90 lamp cord and bracket. 1x WA-16 adaptor for CFL. 1x 48mmx50m roll of Silver Foil Duct Tape. The item "2x LED Panel Hydroponics Setup CFL 130w lamps Grow Tent Ventilation Kit Flower" is in sale since Wednesday, April 13, 2016. This item is in the category "Home & Garden\Yard, Garden & Outdoor Living\Gardening Supplies\Hydroponics & Seed Starting\Grow Light Kits". 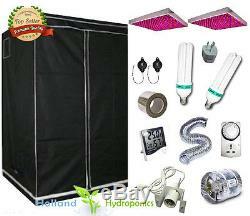 The seller is "hollandhydroponics" and is located in Victoria, Australia. This item can be shipped worldwide.